...say goodbye to shaving and painful waxing! 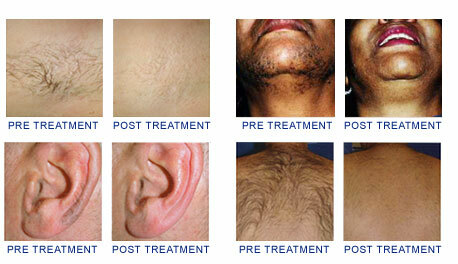 We now have 3 different lasers to accommodate all skin types which includes the YAG & ALEXANDRITE. Available list of areas: Chin, lip, sideburns, cheeks, forehead, unibrow, front of neck, back of neck, underarms, bikini line, top of bikini area, labia, backside brazilian, buttocks, naval, shoulders, right upper arm, left upper arm, right forearm, left forearm, front of lower legs, back of lower legs, front of thigh, back thighs, knees, hands, feet, right side of stomach, left side of stomach, ride side of chest, left side of chest, upper back, middle back, lower back.